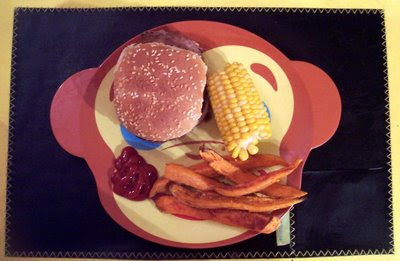 Turkey burger served with sweet potato fries and corn on the cob. Preheat oven to 400°F. Peel sweet potatoes and slice lengthwise into french fry shapes, about 12 per potato. They are extremely firm, so you'll need a heavy duty chopping knife and some well controlled muscle. Toss the sweet potatoes with olive oil, cumin, and paprika, making sure to distribute the spices as evenly as possible. Arrange the sweet potato slices either on a nonstick or foil covered baking tray. (I like to use my broiler pan.) Bake for 30 minutes, pulling them out to turn over and return to the oven half way through. Toss with kosher salt and serve with ketchup. 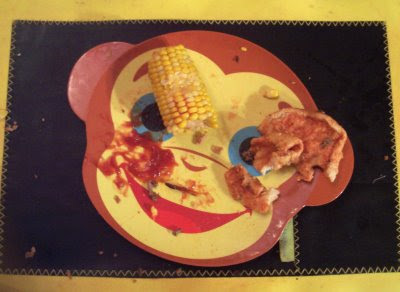 In case you were wondering, that's a chalkboard placemat. 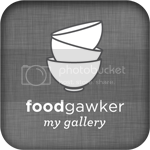 I am so glad you posted this sweet potato fries recipe. Now I have an idea of what spices to use. I've been wanting to try them at home. Every time I have them out, they are SO good. 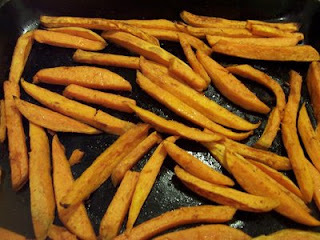 I love making sweet potato fries, I wish my kids would like more spicy foods...I usually just use throw some salt and sugar overtop at the end and let it caramelize a bit and serve with some homemade honey mustard (and they still yap if there isn't enough honey in the mustard!). You should try parchment, I buy huge sheets at the restaurant supply and cut them in half... clean-up is so much easier! And I'm with the Speedbumper - we use the resusable pan liners. I do NOT have time to scrub the non-stick lining off my cookie sheet. I adore sweet potato fries. So easy and satisfying.